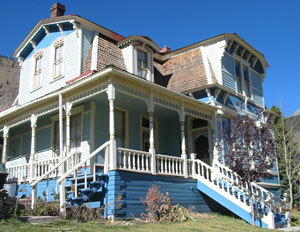 to the Animas Bed & Breakfast at the Wingate House, overlooking the lovely town of Silverton, Colorado. Come inside and let us show you that hospitality, warmth and Victorian elegance are still in high style. Every room features spectacular views, lovely decor, down pillows and comforters, and all the comfort you desire. Try our private whirlpool spa, lounge in our living room warmed by a cozy fire or on the porch in the San Juan Mountain sun. Whatever your pleasure, you will find it at the Animas B&B at the Wingate House. We welcome you!